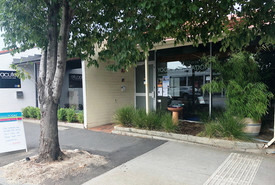 59 Commercial Real Estate and Properties in Melbourne Western Suburbs are listed in 7 categories. We have 99 Industrial Warehouses for Lease , 14 Showrooms for Lease , 13 Offices for Lease , 7 Retail Shops for Lease , 1 Medical and Consulting Properties for Lease and 1 Development Lands for Lease . Office Area 115m2 over two levels Warehouse Area 406m2 Total Area 521m2 Modern staff amenities Container height electric roller door High clearance clearspan warehouse Easy truck access Loading bays Security fencing Street exposure Bounded by major thoroughfares Somerville Road, Boundary Road and Fairbairn Road the complex offers fantastic vantage points to the Port of Melbourne and CBD via the Westgate Freeway and Western Ring Road. Contact Andrew Shields on 0408 443 202 to arrange for an inspection today! Office over 2 levels of 90m2 Warehouse Area 264m2 Total Area 354m2 Modern staff amenities Container height electric roller doors High clearance clearspan warehouses Easy truck access Electronic security gates Public lighting Bounded by major thoroughfares Somerville Road, Boundary Road and Fairbairn Road the complex offers fantastic vantage points to the Port of Melbourne and CBD via the Westgate Freeway and Western Ring Road. Contact Andrew Shields on 0408 443 202 to arrange an inspection today! Office of 444m2 Warehouse of 1074m2 Total area 1518m2 Modern staff amenities 2 Container height electric roller doors Minutes to the Deer Park Bypass with easy connection to all the major arterials Contact Andrew Shields on 0408 443 202 to arrange an inspection today! Office of 222m2 Warehouse of 537m2 Total area 759m2 Modern staff amenities High clearance clearspan warehouse Container height electric roller door Minutes to the Deer Park Bypass with easy connection to all the major arterials Contact Andrew Shields on 0408 443 202 to arrange an inspection today! Office of 120m2 Warehouse of 520m2 Total area 640m2 Container height electric roller door High clearacnce clearspan warehouse Modern staff amenities Ample on site car parks Minutes to the Deer park Bypass with easy connection to all the major arterials Contact Andrew Shields on 0408 443 202 to arrange an inspection today! NOW AVAILABLE READY TO MOVE IN First floor office space 110m2 Modern staff amenities with 2 bathrooms and kitchenette Carpeted with Heating and cooling 4 car spaces Fitted workstations Minutes to the Westgate Freeway and the Western Ring Road and only approximately 15 minutes to the CBD Contact Helen Lipman on 0477 006 134 to arrange an inspection today! Office of 100m2 Warehouse of 540m2 Total area 640m2 Modern staff amenities Container height electric roller door High clearance clearspan warehouse On site car parking available Minutes to the Deer Park Bypass with easy connections to all the major arterials Call Andrew Shields on 0408 443 202 to arrange an inspection today! Office of 88m2 Warehouse of 842m2 Total area 930m2 Modern staff amenities 2 container height electric roller doors High clearance clearspan warehouse Security fencing Minutes to the Deer Park Bypass with easy connection to all the major arterials Contact Helen Lipman on 0477 006 134 to arrange an inspection today! Total area 930m2 Modern staff amenities 2 container height electric roller doors High clearance clearspan warehouse Security fencing Minutes to the Deer Park Bypass with easy connection to all the major arterials Contact Helen Lipman on 0477 006 134 to arrange an inspection today!